Today's reader space is kicking 2014 off with a bang! If you are itching to get your workspace, craft space or creative space in order this year, I have got the sweetest spot for you to check out! I met Laura of Finding Home this past fall at a Better Homes & Garden's event in NYC, and let me tell you, she is fabulous with a capital F! And then I saw her home office/craft space. It was love at first sight and it fit her fabulousness to a T. OK, I am starting to feel like a first grade spelling teacher (who has never been known for my great spelling skills), so I will stop raving and let her take it from here. "The biggest challenge of this space is that it serves many purposes. It is the primary working office for my husband and I, a homework space for my two daughters, my crafting space and a hangout space for my daughters once homework is done. I wanted it to be a place that when we are all 'working', we are still together." Any superstar tips for keeping this space organized? 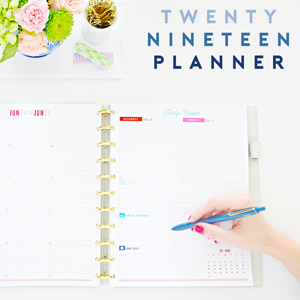 "I think organization is like weight loss, there really is no secret formula, you just have to do it! I really try to put things back when a project is done. My biggest challenge is papers on my desk, so I just try to take time every few days to sort. After just finishing up all of my Christmas crafting and wrapping, I have one pile of things to put away, but I was actually able to maintain order for the first time." "I started out with two cabinets, the white one and the vintage blue lockers that have lots of space and storage and fit in my space. Then I used the measurements of the cabinets to find containers and ordered the full amount I could fit. With this approach, I still have empty containers so I can adjust as needed. I also used chalkboard labels to changing the labels would be easy. 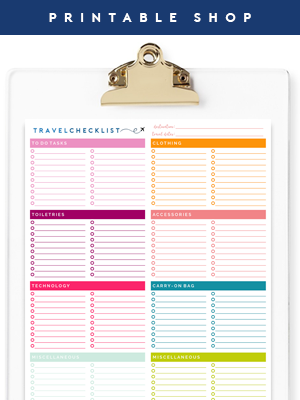 I have everything grouped by logical categories and change the labels as a grouping gets smaller or larger." "As much as it is a functional space, being pretty was important since so much time is spent here. The gallery wall is one of my favorite areas, but my true love is all of the vintage accessories. The little touches such as the vintage truck, the wire baskets and colorful vintage books, make it a happy space to be in. I also really love to tie in sentimental items. 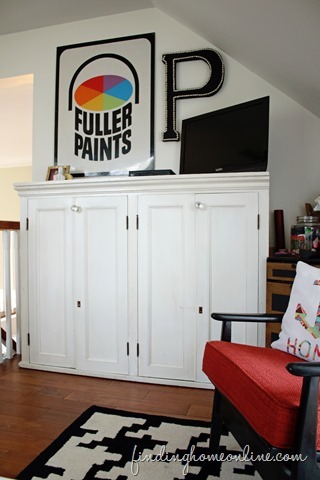 The Fuller Paint sign is reminiscent of one my grandfather had in his painting store in Brooklyn. I also have his certificate framed from when he finished a Dale Carnegie course. The coffee table has the words to one of my favorite songs to sing with my daughters - 'This Little Light of Mine'." 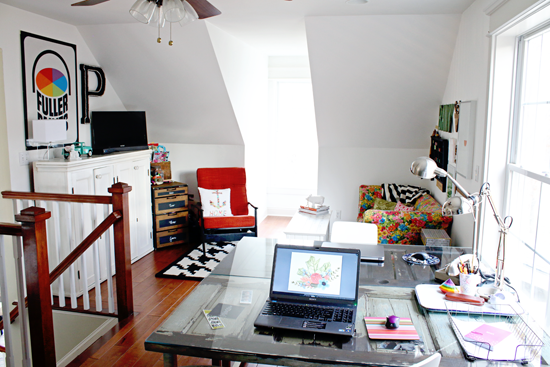 "Almost everything in this space was a DIY project or vintage. The desks in the center of the room are made from vintage doors. The worktable is an old desktop customized with inexpensive 4x4 legs built for my height. The coffee table was found in an 'as-is' pile and given a whole new look. The small sofa is vintage from a yard sale and the gallery wall is either DIY or vintage pieces found inexpensively. The white cabinet was found at a vintage shop and reworked. Even the side table was a run down piece given new life with a vinyl top. But the highlight of the room is the wall-to-wall built-in desk. 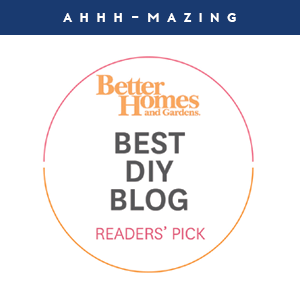 Using stock cabinets and easy box construction, we were able to succeed at our best DIY project to date." "It seems silly to say it has improved our lives, but it really has. 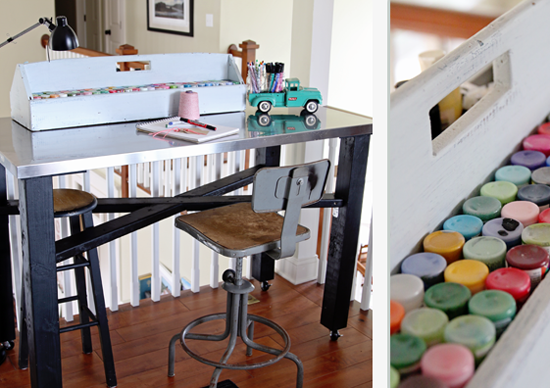 Having a designated place for crafts and projects is so helpful and keeps it out of the rest of the house. Having a nice workspace where my husband and I can easily work together has taken any extra stress off of the situation. But the biggest key is when we really do all use the space, together. That was the original goal that I set out to achieve and I am so glad that it worked out." Stunning right? So much to heart! Family rules! What an inspirational space to spend time together. I adore that a space for everyone was considered a "must" during the designing phase. Every last vintage touch brings so much charm to the room. 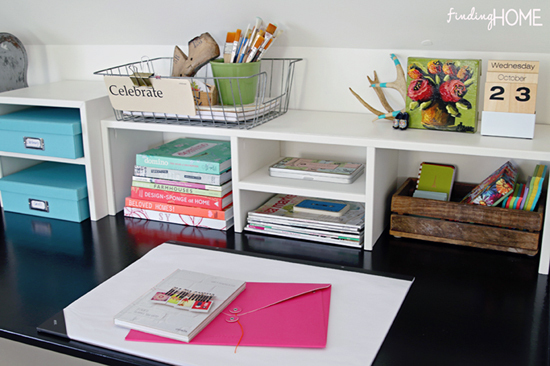 Laura shows us that you can organize using completely unexpected and "found" materials. Custom and homemade workspaces, refurbished storage cabinets and even the small accessories have loads of function! I love what she said about how organizing works for her. She just does it! 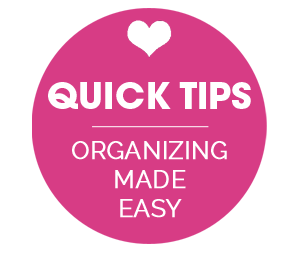 Clutter and piles happen when we don't take the time to put things back where they belong, so keeping an organized and tidy space often times comes down to just being diligent about keeping it that way. 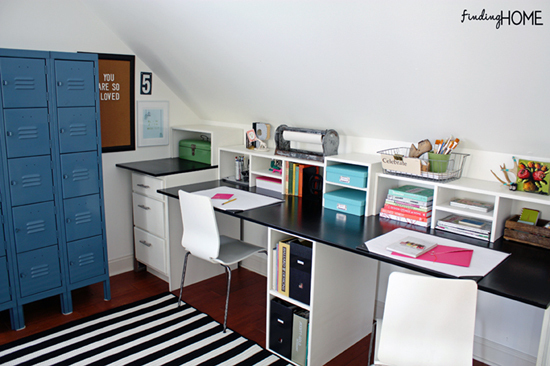 The dual desk has built in storage both above, and below! The space is maximized for organizing, allowing the work surface to remain clutter free. 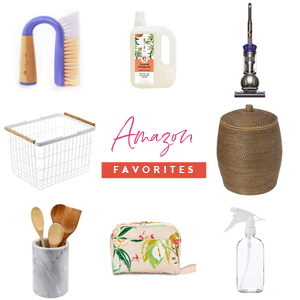 Wire baskets and wooden crates? Can you hear the pitter patter of my happy heart from there? I want to whisper sweet nothings to the striped rug. Such a graphic statement maker! 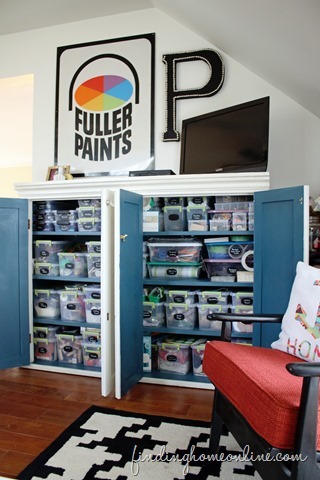 That craft paint crate is darling, and I adore that Laura placed her paints in upside-down to easily see the colors! Did you see the inside of the white craft cabinet?! Endless bins of goodness, all neatly organized and labeled! Yet room for expansion (a must in any craft room)! I admire that Laura planned ahead! 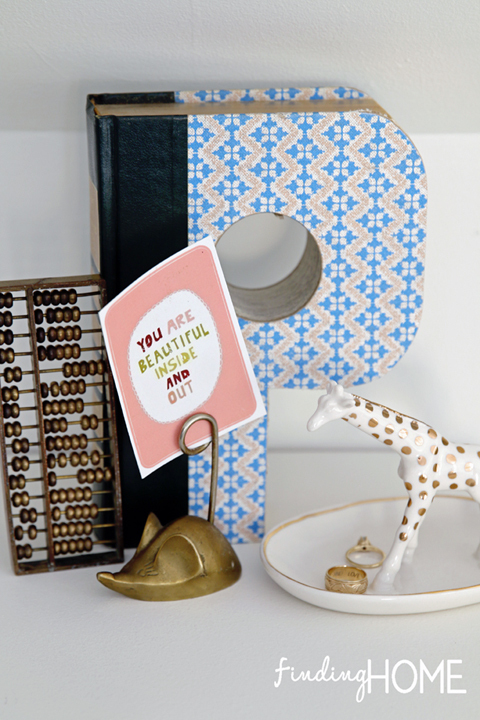 Chalkboard labels offer versatility and flexibility in the most creative space in the home! A family that works together, stays together! Now it is your turn! Did you spot something that made your wheels spin, heart stop or jaw drop? What do you love most about this beautifully created creative space? Are you looking for more eye candy and specific details? You can find all of the goodness over on Laura's blog here. Thanks so much for stopping by today Laura! Now, hop on a plane and help me finish my space next! Pretty please with a cherry on top!? I love this space! It's so bright and cheerful. I love that there is a lot going on, but it all jives well. 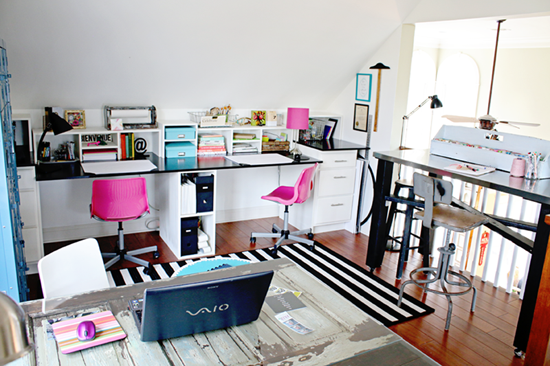 I LOOOVE this space - I would love to have space like this in my home for crafting, blogging and the kids! Very nice space. I love the vintage touches and the desk is amazing! Glass over old doors... Genius!! I need a space like this so desperately! Great inspiration. I love how this space is so functional yet pretty at the same time. It would have been a challenge to pull off a room with so many purposes but Laura has done it perfectly. I adore that striped rug and love the splash of colour in the corner from the floral sofa. Gorgeous!! This is such a great use of space. It takes everyone in the family into consideration! What an inspirational space! I love everything from the architecture and shape of the room to the clever and colorful storage! Beautiful! I love her office! It's so bright and pretty! I love Laura's office - the fact that it is multipurpose and involves the whole family is probably my favourite thing about it. That, and the pops of colour. The peppy colours would brighten up any workspace. And the white cabinet storage, just wow! Where did that book carved in the shape of a P come from? I'd love one if it comes in different letters. Such a beautiful office, I'd love to share an office with my partner but I think he likes having his man den! I love the shared desk in the centre, so versatile. 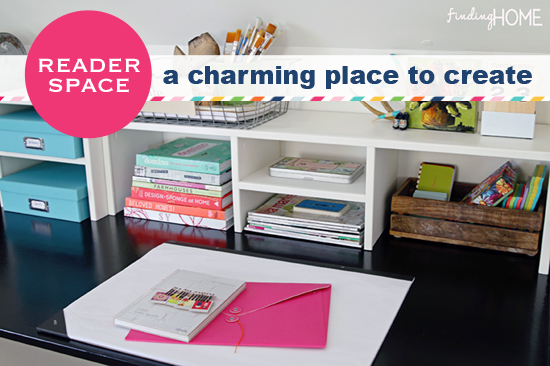 The stationary organization system in this crafty space is to die for!! I love it! I love the giant Ps!! I look everywhere for Hs ( as in spending 20 minutes digging in a pile at Michaels for a small notebook with one on it) and I can never find any vintage or reasonably priced!! Does anyone have suggestions?? Wahouuu!! I Love this space! Great job! Laura is wonderful!!! I met her at our church parenting group - we live in the same town & I LOVE her blog/home. My husband & I ran into her in Hobby Lobby and I wanted to take her home with me. She is super sweet and has awesome ideas!!! Besides you - she is another favorite of mine - it is so cool that you both met!!!!! Looks like Laura has used every inch of the space in her office for a purpose and yet the office space still looks very open and light. Very nicely done!